1. Preheat the grill or light the barbecue. Place the sliced halloumi in a shallow dish and spoon over all but 1 tbsp of the pesto. Leave to stand for 5 minutes. 2. Arrange the halloumi on the grill pan with the tomatoes alongside and grill for 2–3 minutes until the cheese is golden. Turn over and spoon over the pesto. Grill for a further 2–3 minutes until golden and the tomatoes are just charred. 3. Arrange the salad in a shallow serving bowl. Whisk the reserved pesto with the olive oil and lemon juice. Pour over the salad and toss together. 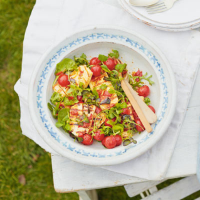 Arrange the grilled halloumi and tomatoes on top and serve.